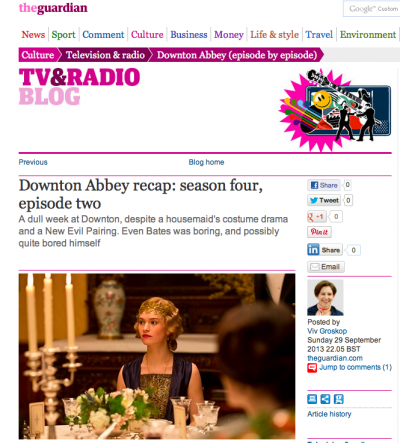 Thankfully this was a return to form (not that Downton Abbey has any reliable form), as most of the commenters seem to agree. In fact it almost felt like an apology for last week’s shenanigans. Which I won’t go into here for (a) fear of spoilerising and (b) fear of recurrence of my post-traumatic stress disorder. UNCLE JULIAN, WHAT HAVE YOU DONE? The less said the better. If you haven’t seen it, don’t click, don’t read anything. Spoiler central. All I have to say is on the blog. 24 hours on, having thought about it, I don’t think it’s going to affect viewing figures either way. I don’t think people will boycott. But I don’t think it’s going to recruit new interest. It might make it a bit stickier for the current audience. Although, heavens, are we long-suffering. Talking all day on radio and TV about Helen Fielding and Mad About the Boy, with my “Bridget-Jones-fan-meets-literary-editor” hat on. (It is a large pink beret.) Let’s just leave aside my discomfort about the fact that it is not actually possible to read the whole book yet. It’s heavily embargoed until next week. 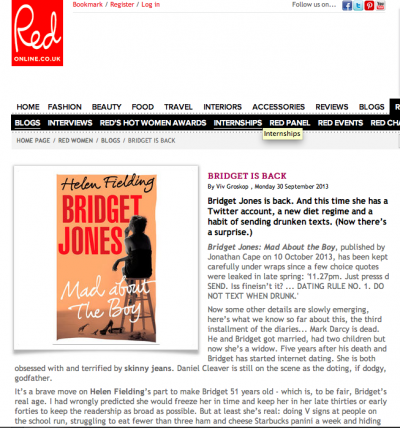 Meanwhile, I’ve speculated a bit for Red Online here about whether it’s a good idea to have made Bridget 51 years old. It’s a gamble. But I guess with 30 million copies sold, Helen Fielding must know what she’s doing, right? Right? The section headings are back by popular demand and this season, as last season, we shall have a winner of the Golden Eyebrow Award, fear not. 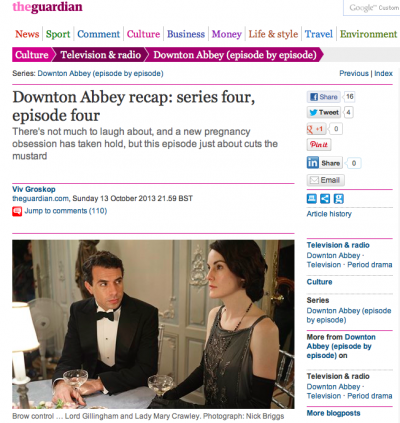 Last series Carson won, pipping the Dowager Countess to the post. Tonight he ties with Lord Grantham as the owner of the most upwardly mobile brow. 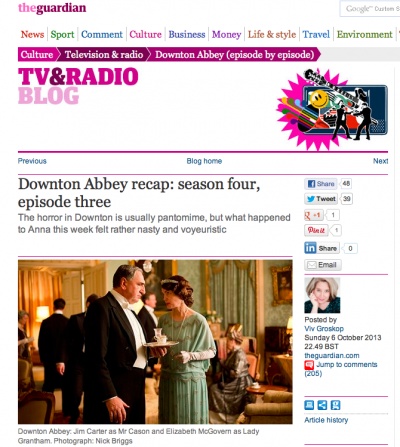 I am sorry to say that I rather despaired of tonight’s episode, reviewed here (beware: spoilers). Many things happened. Many things. Too many things. But none of them were very important or engaging. Have I become jaded after too many tingles? I do rather love Rose, however, silly though her plotline was. And I’m always happy to see Molesley, the Stan Laurel of the cast. At least as the song says — and as I’m sure one of Uncle Julian’s mouse scriptwriters would say, because it’s entirely inappropriate for the period — things can only get better. Jennifer Coolidge! Brett McKenzie from Flight of the Conchords! Lots of good actors and some funny turns! But Austenland is really not that great, I am sad to report. Click here to listen. Presenter Kirsty Lang: “For the first half hour of this film, I thought, ‘I can’t believe I’ve come to see this. This is horrible…'” Me: “I too felt dirty. And I did not think that is what Jane Austen would have wanted.” Stick to DVD box set of BBC’s 1995 adaptation of Pride and Prejudice. So Uncle Julian has returned! And this time he has promised that it will be at least as good as Series One, if not even better. There will be none of the silliness and Melty-Faced Patricks and “Oh, was that a tingle?” moments of Series Two and Three. I do not believe it for a record. 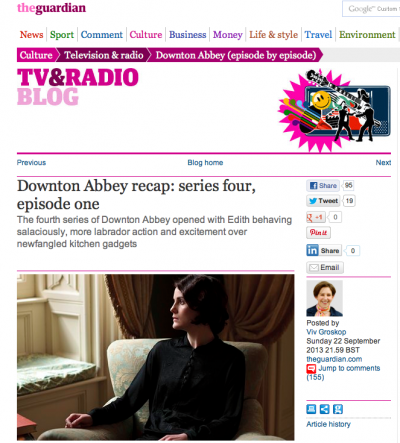 And so far Episode One – reviewed here (beware: spoilers!) – has proven me right. Seven more hours to go. Help. 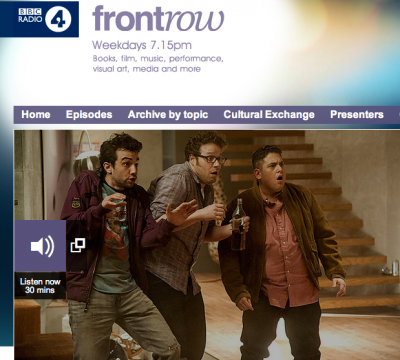 Tonight’s review: Seth Rogen’s directorial debut (here, about 15 mins in), This Is the End. Spent the afternoon watching the film in a screening room where I was the ONLY PERSON laughing. I found out later that presenter Mark Lawson had been in the same screening. So I thought it was a pretty safe bet that he didn’t find the film remotely funny and hated it. It is a reference to Superbad. Turns out Mark Lawson didn’t hate the film. He loved it. Despite best efforts with make-up remover, the traces of the obscene graffito remained on the Tube journey home. 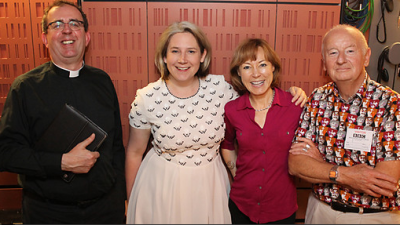 Really enjoyed spending Saturday morning with Rev Richard Coles and Sian Williams (pictured here with studio guest David Chilvers, talking about the visit of COSMONAUT YURI GAGARIN to the UK in 1961). Despite having to (a) talk Russian (b) sing the theme tune to 1983 classic Just Good Friends and (c) admit that my name means “Big Head”, I had a lovely time. 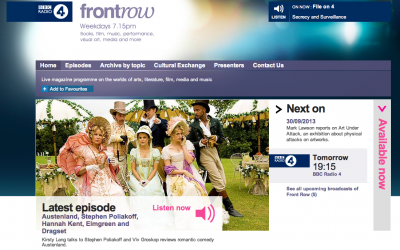 Listen again here. My mid-life crisis stand-up comedy memoir I Laughed, I Cried: How One Woman Took On Stand-Up and (Almost) Ruined Her Life is out one month today! Hurrah! To mark the countdown, Orion has released 10 copies for a giveaway on GoodReads.com. Click here to put your name in the hat. But hurry! The giveaway is only open until 10 June. And if you win, you are supposed to post a review on Goodreads (however short and however negative – it’s OK, I am used to heckling). Other news so far: Last week it went in at No. 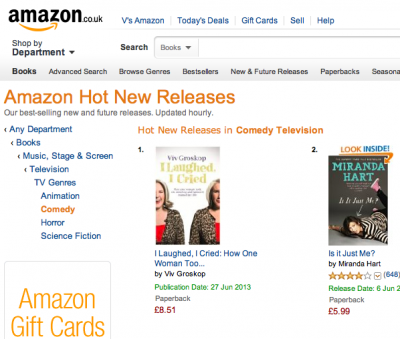 1 on Hot New Releases in Comedy on Amazon. Pick of the Month for June in The Bookseller. Best Non-Fiction Read in Good Housekeeping: “A seize-the-day memoir to inspire anyone with a long-held dream.” In the pages of their June issue I sit proudly alongside ANN WIDDECOMBE. Just as I happily would at any social function. I await your call, Ann. Bring Anton with you. 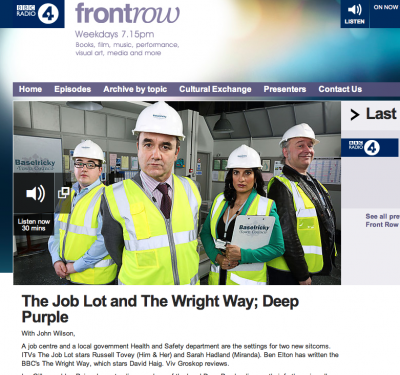 Speaking on BBC Radio 4’s Front Row about The Wright Way, Ben Elton’s new sitcom about a health and safety officer, and The Job Lot, a new ITV “dramedy” set in a job centre. My response confused some listeners. I said I laughed out loud at the slapstick of The Wright Way but, ultimately, was not crazy about it: despite tight writing and some bravura acting performances, it does feel old-fashioned. (Which some people will love. It will find fans amongst Miranda and Mrs Brown’s Boys aficionados.) The Job Lot, on the other hand, has something fresh and different about it. There’s a feel of the best of The Office with a dash of The Thick of It thrown in. Plus it has its own morose, claustrophobic tone. No big laughs and yet possibly the better comedy. I know. It makes no sense.